Three major Holy Land churches implored Israeli Prime Minister Benjamin Netanyahu on Monday to prevent the advancement of a draft bill they said was aimed at expropriating their lands. 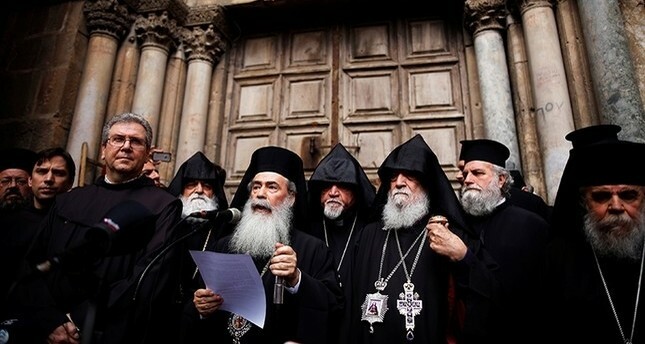 Heads of the Armenian, Greek Orthodox and Catholic churches in Jerusalem also accused the Israeli authorities of failing to keep a commitment made just a few months ago that brought an end to a major crisis between the sides. In February, the Jerusalem municipality began enforcing tax collection on church property, while separately lawmakers in the parliament worked on advancing a law that would allow expropriation of church property. The church leaders in protest closed the Church of the Holy Sepulchre, the site in Jerusalem where Jesus is believed to have been crucified and buried, following which Israeli authorities froze both the tax measures and the legislation, committing to a dialogue with the Christians over the issues. Rachel Azaria, a lawmaker with the centrist coalition party Kulanu, recently renewed work on a slightly revised bill that does not mention churches but would let the state expropriate the rights over lands sold by such bodies in Jerusalem, while offering compensation. In their Monday letter to Netanyahu, the Christian leaders slammed the "scandalous bill," accusing its backers of an "unprecedented attack against the Christians of the Land." "Certain elements in the government of Israel are still attempting to promote divisive, racist and subversive agendas, thereby undermining the Status Quo and targeting the Christian community on the basis of extraneous and populist considerations," they said. The church leaders also said that despite the Israeli commitment to communicate on these issues via a specially appointed committee headed by Regional Cooperation Minister Tzachi Hanegbi, "no dialogue whatsoever has taken place with us" since the end of February. "We view such conduct, from those who promote the bill, as a flagrant violation and undermining of Your Excellency's commitment and of the basic and fundamental freedom of worship," the church leaders said. They urged Netanyahu to swiftly "block the bill whose unilateral promotion will compel the Churches to reciprocate." Large swathes of Jerusalem are owned by various churches, which in many cases reached long-term leasing agreements with the state. Residents living in homes on such lands fear the churches could sell the lands to private developers, who would be free to do as they wish with their property, including raising rents or razing existing structures. Azaria said her bill did not single out churches, and was aimed at solving the problem of "thousands of Jerusalem residents who could lose their homes due to the demands of developers." There was no immediate comment from Netanyahu's office while Hanegbi refused to comment. A spokeswoman for Azaria told AFP the bill was coordinated with Netanyahu and Hanegbi.